You can learn a lot from poo. Fossil poo, or coprolites, can provide valuable information on the size and feeding habits of the organism that produced them. Large Cambrian coprolites are rare, and tend to be circular, but one found in the Lower Cambrian Emu Bay Shale was different. Before going further, you should look at this short TV story that was done last year. It puts the poo in context, and the poo has a small cameo. Keeping with the theme of using black and white photography to show critical features that may not be apparent in colour (in Palaeoporn 12), I have a black and white image of the poo. But before that I need to show you some features of Redlichia highlighted in the following image (click to enlarge). Now pay attention as there'll be a test later. The left hand image shows a complete Redlichia. The feature in the blue box is a thorasic spine. Redlichia had a number of these attached to a number of axial rings, which comprises the central ridge. The central image shows a close up of the tip of the segment in the yellow box, showing the tip of a depression in the segment, or pluron, called the plural furrow. The right hand image shows the head region of a large Redlichia. Around the whole of the outer margin of the head is a thick zone with terrace ridges (in the red boxes) that are common in Redlichia. (Incidentally the structure coming off the head at one of the red boxes, is an antenna). Ok, now for the image of the poo (click to enlarge). The lower image has been augmented to delineate the poo and to highlight certain features. Firstly the size. it's 43 mm in length and has a maximum width of 28 mm. It is formed of two 'layers' an upper diffuse layer, probably representing a fluid phase that has expanded outward. The lower layer is coarse particulate layer is crammed with trilobite fragments. 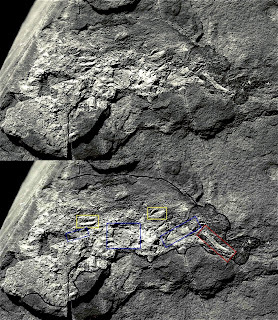 If you compare the boxed areas of the poo with the three part image above (colour coded for your convenience), you should be able to make out just which parts of the ex-trilobite are represented here. The whole of the lower part of the poo is trilobite hash! The poo tells us what was being eaten. The thorasic spine, plural tips and terrace lines present identify the remains as that of a Redlichia. The poo tells us the size of what was being eaten - about 4 cm in length. The poo tells us how it was being eaten. The fragments are broken. They are not crushed. They are not nibbled. They are not gnawed. They are not bitten. This means that the trilobite was broken up and not bitten (see CSI-Cambrian). The poo tells us the size of what was doing the eating. Assuming the trilobite hash layer represents the true original thickness of the poo is 15 mm. This gives us a terminal alimentary tract of 15 mm, which roughly correlates with a 75 cm body size (from measurements done of other Cambrian fossils). The poo tells us what was doing the eating. The broken up fragments and the size of the organism suggests Anomalocaris was the perpetrator. So this one specimen tell us that two particular species were present, which was the predator, which the prey, and the method of predation. Not bad for a piece of crap! A very cool piece of evidence for your CSI-Cambrian, Anomolacaris-flexing trilobite idea! Fascinating poo post. It looks like some minor corrections are needed. The complete fossil is the left-hand image, not the right-hand image. It is also extremely puzzling that a creature with an alimentary tract of 1.5 cm is only .75 cm long. Unless anomalocaris was the original giant a-hole.